What is Krugle.com, you ask? In short, Krugle is a search engine for developers. Krugle allows developers to search for source code, find code related technical information, and save, annotate and share these searches with other developers — all from a single, easy-to-use, web application. Read more about Krugle and view screenshots of the new application on the Krugle product page. 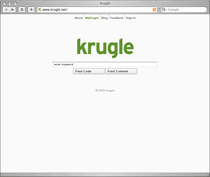 In true Web 2.0 style, Krugle is inviting developers to participate in a Beta release of the search engine. If you are a developer be sure to signup early; the invite is first come, first served. The only thing possibly cooler than the new Krugle search engine is the team behind it — a big thank you to Don Thorson and John Mitchell of Krugle, and Allen Ashton and Scott Panton of Ashton Abeck Design for allowing me and TrendMedia to be a part of the initial Krugle site launch. A great product backed by a great team — what more could you ask for? Knock ‘em dead at DEMO, guys!! This entry was written by Brian McNitt, posted on at 3:43 pm, filed under Web Development. Bookmark the permalink. Follow any comments here with the RSS feed for this post. Post a comment or leave a trackback: Trackback URL. Thanks for all of the hard work. The feedback that we’re receiving about the site has been fantastic. I was just winding down for the day, sifting through my RSS feeds looking for something interesting when I noticed that a story about Krugle made the home page of Digg.com! Sweet! Well, will you make my day and get me a login to the beta site? I’ve been a developer for over 12 years and would love to check out the site. Make that…on the Digg.com Home Page, the top of the Digg.com Programming category, and currently top-5 on the Del.icio.us Popular list. Wow. You go, Krugle! I did wonder what you were up to, nice work, very cool site. After twelve years…what’s a few more days!? Seriously though, I don’t have access to the queue. That said, I can assure you that Krugle is working hard to get *all* Beta invites out, including yours, and they want you using the app ASAP. Therippa, assuming you signed up today you should be one of the first in. Please stay tuned and thanks for your patience! Krugle gets 6,000 Beta sign-ups in 48 hours. Wow. well managed buzz. but, did they know that koders.com and docjar already exist? i suppose krugdle is going to be different, right? but koders is already on desktops and they have an enterprise version too. i have a koders.com plugin installed in Eclipse already. and the code recommendation feature is awesome. just wait for the alert, then copy and paste. i will give krugdle a try. when are they going to release beta? Add Technorati Top Searches to the mix. See Krugle in action; video from the DEMO conference.